Student life means grueling lectures, all nighters, nearly empty pockets and a forever rumbling tummy. The lunch that you take along vanishes before the lunch break (courtesy like-minded hungry souls) and by the ned of the day, you become a hunger struck maniac. Looking for pocket friendly places becomes a your chief concern and you’re ready to gobble it all up. It was on such a day that I stumbled upon a tiny cart parked outside Law Faculty that served Rajma Chawal and coffee. The man, Raju has been feeding the North Campus crowd for about 10-12 years. After enjoying a wholesome plate of Rajma Chawal and a cup of coffee, I proceeded to ask him how it all began and the story was quite interesting. About 2-3 years ago, he strated selling Rajma Chawal. Around 12-12:30 p.m., you will always find a teeming crowd of students near his stall. Unlike other street vendors, he serves the food very gently and pours just the right amount Rajma; neither less nor too much so as to flood your plate. And the quantity is good enough for two people as well. The plump grains of rice and Rajma make quite an impressive heap on your plate. The Rajma is not very greasy or spicy and therefore can be eaten with ease even by the health freaks. This simplicity of preparation reminds you of home cooked food as it will taste similar. Boxes of salt, chaat masala and pickles are kept aside if you want to add more flavor to your meal. And the best part is that a plate of Rajma Chawal costs only 80 bucks. 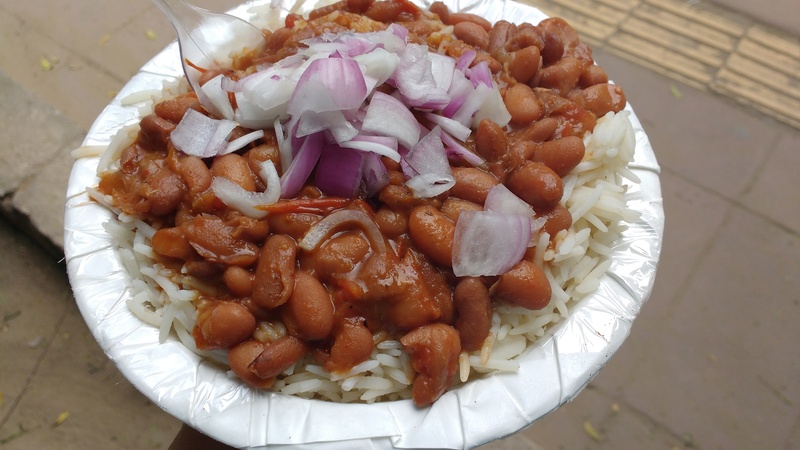 An inexpensive and piping hot plate of Raju bhaiya’s Rajma Chawal is just what you need to refuel your body after college. They serve one of the best coffees you can ever find on Chhatra Marg. Each cup is sprinkled with cocoa powder; a tradition that is gradually vanishing in favour of coffee art at big restaurant and cafes.